Ei! Chegamos às 11 horas da noite em inglês. Nesse horário, o sol já se pôs faz tempo. Já já é meia noite e um novo dia irá surgir. 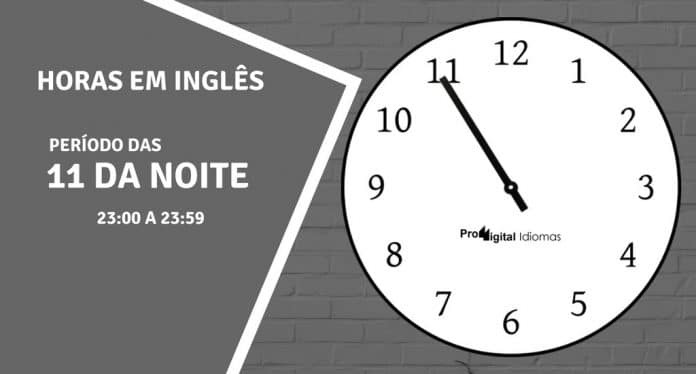 Mas antes que isso aconteça, vamos aprender um pouco sobre o relógio em inglês das onze horas da noite, mais especificamente, vamos aprender a escrever todas as horas em inglês por extenso das 23:00 às 23:59. São 60 minutos em inglês, e para cada minuto, existem diversas formas de escrita. Então pegue aí o caderno de anotação ou, se você for mais moderno e avançado, então baixe aí o Anki no seu celular ou computador. Essa ferramenta vai te ajudar muito, pois ela usa um sistema chamado Spaced Repetition (Repetição Espaçada) que consiste num aprendizado repetitivo com intervalos de tempo suficientes para uma memorização rápida e fácil. Acesse aqui para conhecer e baixar o Anki. O horário exato em inglês, geralmente tem o uso do termo “o’clock” para justamente designar a hora em ponto como, por exemplo, 11 o’clock (11 horas em ponto). Abaixo podemos ver como é usado esse termo para dizer 11 horas da noite em ponto (23 horas). Então vamos começar a nossa tabela de horas em inglês abaixo, e aprender de início a escrever todas as horas em inglês por extenso das 23:00 às 23:14. One minute past eleven One minute past eleven p.m.
One past eleven One past eleven p.m.
Two minutes past eleven Two minutes past eleven p.m.
Two past eleven Two past eleven p.m.
Three minutes past eleven Three minutes past eleven p.m.
Three past eleven Three past eleven p.m.
Four minutes past eleven Four minutes past eleven p.m.
Four past eleven Four past eleven p.m.
Five minutes past eleven Five minutes past eleven p.m.
Five past eleven Five past eleven p.m.
Six minutes past eleven Six minutes past eleven p.m.
Six past eleven Six past eleven p.m. Seven minutes past eleven Seven minutes past eleven p.m. Seven past eleven Seven past eleven p.m. Eight minutes past eleven Eight minutes past eleven p.m. Eight past eleven Eight past eleven p.m.
Nine minutes past eleven Nine minutes past eleven p.m.
Nine past eleven Nine past eleven p.m. Ten minutes past eleven Ten minutes past eleven p.m. Ten past eleven Ten past eleven p.m.
Eleven minutes past eleven Eleven minutes past eleven p.m.
Eleven past eleven Eleven past eleven p.m.
Twelve minutes past eleven Twelve minutes past eleven p.m.
Twelve past eleven Twelve past eleven p.m.
Thirteen minutes past eleven Thirteen minutes past eleven p.m.
Thirteen past eleven Thirteen past eleven p.m.
Fourteen minutes past eleven Fourteen minutes past eleven p.m.
Fourteen past eleven Fourteen past eleven p.m.
Os nativos da língua inglesa costumam usar um termo que é bastante comum no dia a dia para facilitar a forma de dizer e escrever o horário com os 15 minutos em inglês. Esse termo é “a quarter past” (um quarto depois / um quarto passado). Abaixo podemos ver como fica o seu uso na escrita para o relógio em inglês das 11:15. Então vamos dar uma olhada abaixo e depois aprender a escrever todas as horas em inglês por extenso das 23:15 às 23:29. Fifteen minutes past eleven Fifteen minutes past eleven p.m.
Fifteen past eleven Fifteen past eleven p.m.
A quarter past eleven p.m.
Sixteen minutes past eleven Sixteen minutes past eleven p.m.
Sixteen past eleven Sixteen past eleven p.m.
Seventeen minutes past eleven Seventeen minutes past eleven p.m.
Seventeen past eleven Seventeen past eleven p.m.
Eighteen minutes past eleven Eighteen minutes past eleven p.m.
Eighteen past eleven Eighteen past eleven p.m.
Nineteen minutes past eleven Nineteen minutes past eleven p.m.
Nineteen past eleven Nineteen past eleven p.m.
Twenty minutes past eleven Twenty minutes past eleven p.m.
Twenty past eleven Twenty past eleven p.m.
Twenty-one minutes past eleven Twenty-one minutes past eleven p.m.
Twenty-one past eleven Twenty-one past eleven p.m.
Twenty-two minutes past eleven Twenty-two minutes past eleven p.m.
Twenty-two past eleven Twenty-two past eleven p.m.
Twenty-three minutes past eleven Twenty-three minutes past eleven p.m.
Twenty-three past eleven Twenty-three past eleven p.m.
Twenty-four minutes past eleven Twenty-four minutes past eleven p.m.
Twenty-four past eleven Twenty-four past eleven p.m.
Twenty-five minutes past eleven Twenty-five minutes past eleven p.m.
Twenty-five past eleven Twenty-five past eleven p.m.
Twenty-six minutes past eleven Twenty-six minutes past eleven p.m.
Twenty-six past eleven Twenty-six past eleven p.m.
Twenty-seven minutes past eleven Twenty-seven minutes past eleven p.m.
Twenty-seven past eleven Twenty-seven past eleven p.m.
Twenty-eight minutes past eleven Twenty-eight minutes past eleven p.m.
Twenty-eight past eleven Twenty-eight past eleven p.m.
Twenty-nine minutes past eleven Twenty-nine minutes past eleven p.m.
Twenty-nine past eleven Twenty-nine past eleven p.m.
Os nativos possuem um termo específico para designar a meia hora em inglês. É o termo “half past” (meia hora depois / meia hora passado). E esse termo é também muito comum o uso no dia a dia para deixar a fala mais fácil. Vamos aprender abaixo como é usado esse termo na escrita. E depois vamos aprender a escrever todas as horas em inglês por extenso para o período das 23:30 às 23:44. Thirty minutes past eleven Thirty minutes past eleven p.m.
Thirty past eleven Thirty past eleven p.m.
Thirty-one minutes past eleven Thirty-one minutes past eleven p.m.
Thirty-one past eleven Thirty-one past eleven p.m.
Thirty-two minutes past eleven Thirty-two minutes past eleven p.m.
Thirty-two past eleven Thirty-two past eleven p.m.
Thirty-three minutes past eleven Thirty-three minutes past eleven p.m.
Thirty-three past eleven Thirty-three past eleven p.m.
Thirty-four minutes past eleven Thirty-four minutes past eleven p.m.
Thirty-four past eleven Thirty-four past eleven p.m.
Thirty-five minutes past eleven Thirty-five minutes past eleven p.m.
Thirty-five past eleven Thirty-five past eleven p.m.
Thirty-six minutes past eleven Thirty-six minutes past eleven p.m.
Thirty-six past eleven Thirty-six past eleven p.m.
Thirty-seven minutes past eleven Thirty-seven minutes past eleven p.m.
Thirty-seven past eleven Thirty-seven past eleven p.m.
Thirty-eight minutes past eleven Thirty-eight minutes past eleven p.m.
Thirty-eight past eleven Thirty-eight past eleven p.m.
Thirty-nine minutes past eleven Thirty-nine minutes past eleven p.m.
Thirty-nine past eleven Thirty-nine past eleven p.m.
Forty minutes past eleven Forty minutes past eleven p.m.
Forty past eleven Forty past eleven p.m.
Forty-one minutes past eleven Forty-one minutes past eleven p.m.
Forty-one past eleven Forty-one past eleven p.m.
Forty-two minutes past eleven Forty-two minutes past eleven p.m.
Forty-two past eleven Forty-two past eleven p.m.
Forty-three minutes past eleven Forty-three minutes past eleven p.m.
Forty-three past eleven Forty-three past eleven p.m.
Forty-four minutes past eleven Forty-four minutes past eleven p.m.
Forty-four past eleven Forty-four past eleven p.m.
Quando o relógio em inglês estiver faltando 1/4 de uma hora cheia (15 minutos) para chegar ao próximo horário, então os nativos costumam usar o termo “a quarter to” para representar esse restante de tempo faltante. Vamos ver abaixo como fica a sua escrita para podemos entender melhor. E depois, vamos terminar a nosso tabela de horas em inglês para o período das 11 horas da noite, aprendendo a escrever todas as horas em inglês por extenso das 23:45 às 23:59. Forty-five minutes past eleven Forty-five minutes past eleven p.m.
Forty-five past eleven Forty-five past eleven p.m.
A quarter to twelve p.m.
Forty-six minutes past eleven Forty-six minutes past eleven p.m.
Forty-six past eleven Forty-six past eleven p.m.
Forty-seven minutes past eleven Forty-seven minutes past eleven p.m.
Forty-seven past eleven Forty-seven past eleven p.m.
Forty-eight minutes past eleven Forty-eight minutes past eleven p.m.
Forty-eight past eleven Forty-eight past eleven p.m.
Forty-nine minutes past eleven Forty-nine minutes past eleven p.m.
Forty-nine past eleven Forty-nine past eleven p.m.
Fifty minutes past eleven Fifty minutes past eleven p.m.
Fifty past eleven Fifty past eleven p.m.
Fifty-one minutes past eleven Fifty-one minutes past eleven p.m.
Fifty-one past eleven Fifty-one past eleven p.m.
Fifty-two minutes past eleven Fifty-two minutes past eleven p.m.
Fifty-two past eleven Fifty-two past eleven p.m.
Fifty-three minutes past eleven Fifty-three minutes past eleven p.m.
Fifty-three past eleven Fifty-three past eleven p.m.
Fifty-four minutes past eleven Fifty-four minutes past eleven p.m.
Fifty-four past eleven Fifty-four past eleven p.m.
Fifty-five minutes past eleven Fifty-five minutes past eleven p.m.
Fifty-five past eleven Fifty-five past eleven p.m.
Fifty-six minutes past eleven Fifty-six minutes past eleven p.m.
Fifty-six past eleven Fifty-six past eleven p.m.
Fifty-seven minutes past eleven Fifty-seven minutes past eleven p.m.
Fifty-seven past eleven Fifty-seven past eleven p.m.
Fifty-eight minutes past eleven Fifty-eight minutes past eleven p.m.
Fifty-eight past eleven Fifty-eight past eleven p.m.
Fifty-nine minutes past eleven Fifty-nine minutes past eleven p.m.
Fifty-nine past eleven Fifty-nine past eleven p.m.
É isso aí (That’s it)! Acabamos de estudar cada um dos 60 minutos do relógio das 11 horas da noite em inglês. Como pudemos ver, existem diversas formas para se escrever cada uma das horas em inglês por extenso. Portanto, esteja sempre revisando essa tabela para o seu cérebro conseguir gravar cada um desses formatos. E use a ferramenta Anki para te ajudar na memorização. Conhece mais algum formato para escrever as horas em inglês dentro do período das 11 horas da noite? Conte para nós nos comentários abaixo.